Okra contains Vitamin A & C and is a good source of Iron & Calcium. To get rid of its sliminess, it is either stir-fried for a long time on a low flame, or acidic ingredients like Tamarind, Tomato or Yoghurt is added which also helps its cooking faster. This is a simple and usual stir fry but with the addition of Tamarind. I learnt this recipe from my Chithi (Mom’s sister) and very much fond of this because of its tangy taste. This goes well with Curd Rice or Rice with Sambar / Dhal Curry. Cut Okra into very fine pieces. Peel and Chop Pearl Onions. Cut Chillies into two. Soak Tamarind in water for 2-3 minutes and extract its Juice. Heat little Oil in a Pan. When hot, add Mustard seeds. Wait till it pops up and then add Urad Dhal & Curry Leaves. Few seconds later, add Onions and fry till slightly brown. Add chopped Okra. Sprinkle all the Powders and Salt. Mix well and fry for a while. Now add Tamarind Juice. Mix well and fry till done. Serve with Rice and Sambar/Dhal Curry/Curd. 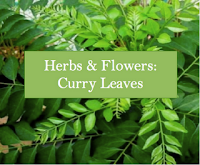 This goes to Herbs & Flowers: Curry Leaves of Taste Junction initiated by PJ of Seduce your Taste buds. looks great...i have never tried it with tamarind juice...okra as it is has a tendency to get soggy...doesn't adding tamarind make it soggy or is it supposed to be little gravy like? No arthi, we add only few spoons of juice; it gets absorbed soon; its sliminess goes off and gets cooked faster.. This is a stir fry not gravy..
Okra is my favorite. I always love to have this puli pachadi with dhal. Delicious Okra recipe looks yummy..i used to add yogurt..this time will try with tamarind juice. simple okra fry, looks superb, love the addition of tamarind, will try it this way soon..
looks so inviting and lovely preparation...adding tamarind juice is new n will try sometime..
addition of tamarind sounds new n good..
Looks perfect and so yum! very nice curry...it can be made little watery even with little jaggery...! I follow ur blog regularly...do visit my blog.am new to blogging.I would be glad if you join my site and encourage me:-)! Pachadi looks to be very easy to prepare and delicious. One of my fav recipes :D Looks so yum.. Love it..